The nose has treacle, toffee, cinnamon, nutmeg, and a little bit of cherry. The mouthfeel is decent with a little cling. The body has rye whisky(! ), toffee, treacle, sultanas and ginger. The finish has ginger and hints of both ginger and peppercorns. Water brings out thin, rapidly expanding wholring that settles quickly into lingering mottling. The nose gains madeira cake and loses the toffee and cinnamon. 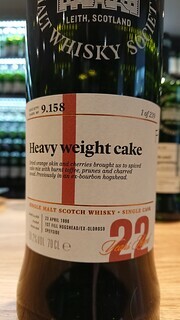 The body gains more of that madeira cake, and loses the rye whisky note. The finish gains more sultanas and loses the peppercorns.